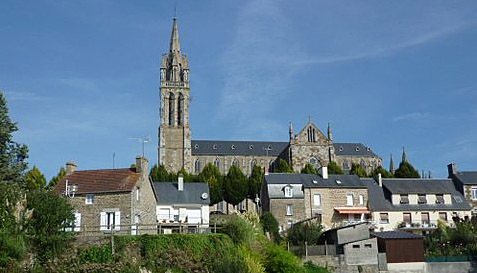 Located to the west of Paris are the areas of Normandy and Brittany. Noted for cheeses and cider, the area around Normandy is best known for its links with the Allied landings on D-Day when troops from the United Kingdom, United States and elsewhere landed on the beaches of Northern France. The region has a number of war graves, museums and towns who owe their survival to those brave soldiers who arrived by land and air some 70 years ago. Many of the military sites are located on the coast. These include Utah Beach, the western-most invasion beach, and Omaha Beach. 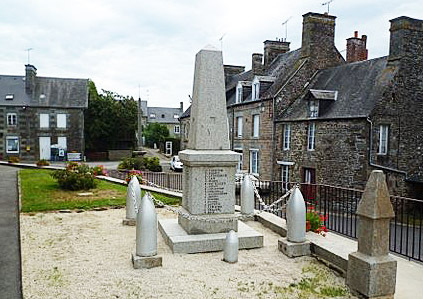 Lots of small towns on the Cotentin Peninsula have memorials and sometimes small museums commemorating these events. There is also a U.S. war grave at Colleville-sur-Mer. The area has a beautiful coastline with little seaside towns such as Barfleur and St. Vaast just a short ride from the port of Cherbourg. Here you will find a plethora of sailing yachts and a smattering of hotels and restaurants. Farther down the peninsula you come to the famous Mont Saint-Michel. It was once known as the mount “in peril from the sea” due to the medieval pilgrims who died trying to cross the quick sands to get to the abbey. 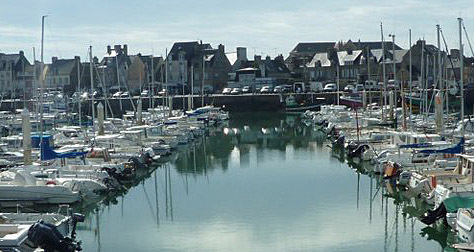 A short drive from here toward St. Malo is the seaside town of Cancale known locally for its oysters. Inland, the countryside is very pleasant with chateaus and small towns full of character. 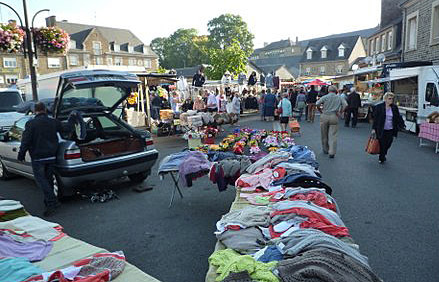 Market day in France is a big event, and so you should take a leaflet from the local tourist office and arrive early for all the bargains. There are plenty of delightful hotels along the coast. Two of my favorites in St. Vaast close to Utah Beach are the Hotel La Granitière and the Hotel de France et des Fuchsias, which has some rooms overlooking an enclosed garden. The owner of La Granitière has a great interest in the Second World War and the landings on the nearby beaches. Inland there are small hotels and auberges (inns). The town of Saint-Hilaire du Harcouet is well placed as is the pretty town of Ducey with its watermill hotel. For somewhere a bit different, you could try the formally laid out town of Bagnoles de l’Orne, an exclusive spa tucked away deep inland. The season here lasts from April to October. There are also self-contained gites (holiday homes available for rent). These can vary from the very simple, often a long way from any development, to the more sophisticated with large grounds and a swimming pool. The food and drink in Normandy and Brittany are excellent. The camembert cheese is world famous, and locals will often drink cider from bowls to accompany their meals. Galettes are a popular dish. Made from buckwheat, they are similar to savory pancakes. Often served with ham, cheese and eggs, they are delicious. On the coast, seafood is popular with lots of different types of mussels and oysters. Lunch is the main meal of the day, and it is possible to get an excellent four-course meal for as little as 12 euros. Lamb, veal, rabbit and chicken are common meats. Fish is also on lots of menus. Breakfast is kept simple with a coffee and fresh bread or rolls, while in the evening they will often have cold meats and a variety of cheeses. If you are in Saint-Hilaire du Harcouet you should try the restaurant Le Mail near the church. It is always full of local workers. 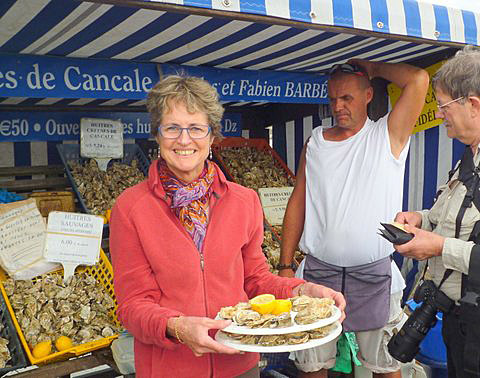 In Cancale on the coast near St. Malo, oysters and mussels are very common, while in many smaller cafes and bars you will be able to get a filled savory galette or croque monsieur (a grilled cheese and ham sandwich). As is the case in most rural areas, entertainment is homemade, and you will often find an evening event taking place in the market square. Fetes are popular in the summer, and you may come across traditional dancing in costumes. Many of the men play pétanque. This is a form of boules (bowls) where the idea is to throw hollow metal balls as close as possible to a small wooden ball known as a cochonnet. There is usually a special area set aside in the village for this to take place. Most people also make for the local bar in the evening. You may, however, find more nightlife on the coast in the larger towns such as Cherbourg and Caen. You might like to combine a trip to this region with a visit to the UK. There are ferries to Cherbourg, Caen and Le Havre from Portsmouth and Poole on the south coast. Crossing times are in the region of four to five hours. If you are flying, the best idea is to go into Paris and then catch a high-speed train, which will take you to one of the nearby towns. 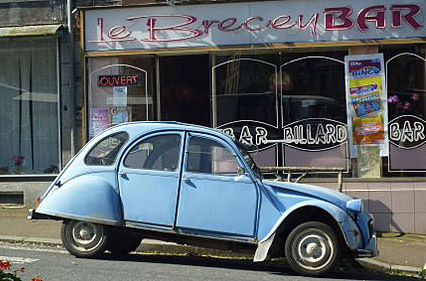 Car rentals are also very reasonable in France and a good way of exploring the beautiful coastal area and inland. Delta, United and Air France have plenty of flights from the U.S. The author would like to thank Brittany Ferries for their support on this trip. How To Get There: As noted by the author, a great way to get to Normandy and Brittany is by flying to Paris, followed by a train ride.Paris has two major airports: Charles de Gaulle Airport (CDG) and Orly Airport (ORY). de Gaulle is Europe’s second busiest airport (behind London Heathrow) and is served by over 100 different domestic and international airlines including Air France, Delta and United, with nonstop service from Chicago, New York City, San Francisco and more. Information regarding area transportation is available here. You can get to Normandy from de Gaulle airport by first taking the RER Line B to Paris Nord station. Then switch over to Line E to Gare Saint Lazare, and then grab any one of the trains to Normandy. Orly also has international flights, but only has nonstops from Newark and New York JFK airports. More information regarding area transportation is available here. Best Time To Visit: Like with many destinations in Europe, the best time to visit is dependant on what you’re looking for. Summer is the best time to visit for the good weather and tourist activities, but is also crowded and expensive. Winter is the cheaper time for hotels and airfares, but the weather is cold and you’d run into attractions that are closed for the season. An ideal option is the shoulder season in spring, when you can still find good airfare and hotel deals, and the weather is more managable than winter, and the crowds haven’t started yet. Try and avoid visiting in fall, as the region sees the most rainfall during this time.